You probably thought it was all over, though puzzled that you hadn't heard anything about a decision. That's because the decision has been massively delayed: Hjaltland made such a bish of their Environmental Impact Assesments (EIAs) that the Highland Council requested they repeat the seabed surveys at the two sites. [In our opinion, they should have been obliged to repeat a lot more.] These were carried out in February and April, but were published only recently, with most of the Eishort 2 documents delayed even beyond the beginning of the consultation period (but now available). 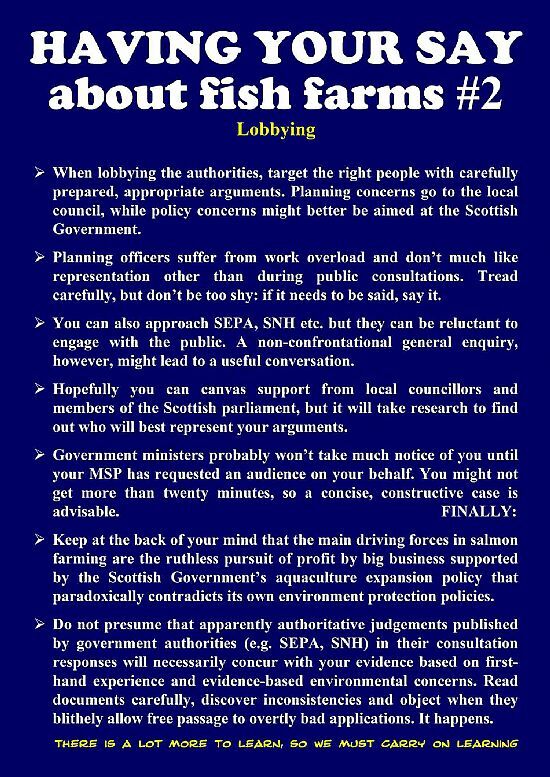 The documents we will be evaluating in these new public consultations are only those relating to the two stunningly inept seabed surveys and we may comment only on those, not on any other aspects of the two Loch Eishort applications or fish farming in general. The main documents requiring our attention are the two seabed survey reports. The rest (all linked HERE dated 4th Sept) are supporting and replicated material (i.e. padding). You can find out just how lousy even the revised surveys and reports are by browsing comment letters already submitted by the SST-T team HERE. If you want to see the seabed video footage (hours and hours of it), we have copies of each on a couple of flash drives. These videos are not quite as hilariously incompetent as Hjaltland's previous attempts, but their 'experimental design' is similarly haphazard and the information gleaned from the surveys to construct the reports is just as sparse, poorly presented, badly analysed (actually, not analysed at all) and, therefore, falls a long way short of meaningfully informative. We can probably expect SNH to be not very critical, if at all, so it will be up to us to advise the planning officers appropriately in our customary facts-only way. FYI, we will post your SST-T representatives' comment letters HERE, along with other resources we think might help you as the consultations procedes, so please visit these pages regularly until the consultation period expires (2 October). 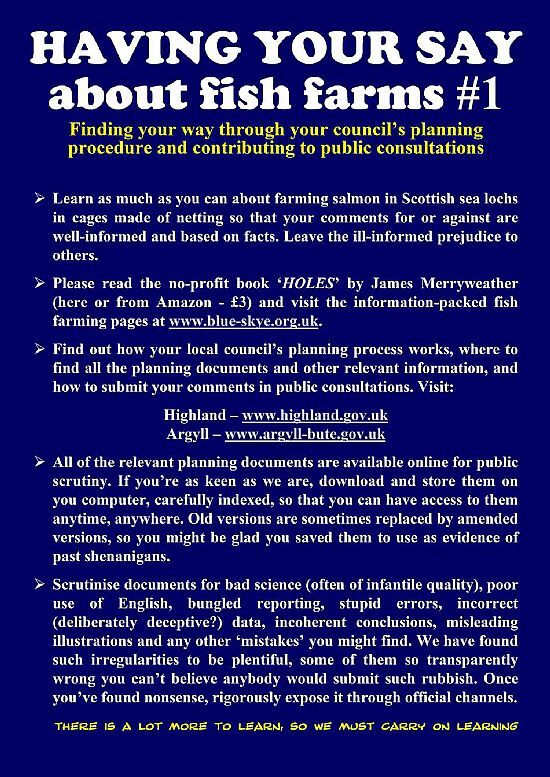 Below are two posters from our exhibition that help explain how to comment on fish farm planning applications. Comments should be submitted via the online forms HERE for Eishort 2 and HERE for Eishort 1 or sent as a PDF or doc file attached to an e-mail to eplanning@highland.gov.uk or write to: ePlanning centre, Glenurquhart road, Inverness IV3 5NX. Meanwhile, here are recent responses from the Scottish Environmant Protection Agency (SEPA) showing that even they remain dissatisfied with Hjaltland's revised seabed surveys: EISHORT 2 & EISHORT 1. Maybe SNH will also have something to say, but don't expect it to be particularly strident. Why do we put Eishort 2 before Eishort 1? Because that's the way they were submitted and handled, and - much to our annoyance - it's been the cause of confusion throughout this dual planning application. But we won't let it get us down.